WORLD-CLASS FISHING FROM INCHES ABOVE THE WATER! East Cape Kayak Fishing has put together the most experienced and professional group of kayak fishing guides in the country to insure you have the trip of a lifetime. In addition to their scheduled trips, all of our guides are available for private trips to our regular destinations as well as locations of your choice. Our extremely experienced guides are willing to travel the world to help you get on that fish of a lifetime. We are available to guide on mothership trips as well as trips to other local or exotic locations of your choice. Tell us what you are interested in and we can put you with the right guide. We are also available for personal appearances, seminars, and video work. Please read the bios below to learn about our professional staff of kayak fishing guides. Please fill out our contact form for more information about our scheduled trips or to book one of our guides for a private kayak fishing adventure. A San Diego California native and certified fish and game and IGFA licensed guide, Jim is recognized worldwide as a pioneer in the sport of kayak fishing. Involved in the sport of kayak fishing for over twenty years he owns and runs La Jolla Kayak Fishing Adventures guide service and has work closely with kayak manufacturers on the development of new kayak designs and with various fishing tackle and kayak accessory companies on their growing kayak fishing line of products. Jim's list of accomplishments from his kayak are many and include landing the first and still only Marlin from a kayak in California, numerous kayak fishing records, and a kayak caught species list of over one hundred and twenty. Jim is most proud of guiding thousands of new kayak anglers to their first fish off of a kayak, and turning them onto the sport he loves. He has also taken over 40 adventurous kayak anglers to the next level by getting them on their first Marlin from a kayak, while on trips Jim guided in Mexico. With his trademark hat and his numerous special appearances on a variety national fishing shows, Jim has become one of the most recognizable kayak anglers in North America. But it's his infectious enthusiasm for the sport, his lively personality and his passion for sharing the sport with others which has made him and an ideal host of The Kayak Fishing Show with Jim Sammons, which airs on The World Fishing Network, and The Extreme Kayak Fishing Challenge, which airs on NBC sports. Raised near the banks of the American, Sean spent nearly every waking hour of his childhood chasing fish in the river. Sean realized his dream of chasing fish professionally after receiving his degree in Fisheries Biology from Humboldt State University in 1991. Sean bought a kayak in 2001 as a "temporary measure" to fill a void after selling his power boat. The temporary measure instantly became an obsession and has become a lifestyle for Sean and the rest of the White family. Sean and his wife Leah opened the Great White Kayak Company in 2003. Sean and Leah also host two of the largest kayak fishing tournaments in NorCal including the "Elk Rockfish Fiesta" and "Bendo at Mendo". Sean is also a California Department of Fish and Game licensed guide. As a life-long Northern California resident Sean spends a lot of time kayak fishing for cold-water species such as striped bass, steelhead, lingcod, and halibut. However, the entire White family makes extended annual excursion to Mexico to soak their feet in warm water and target Baja's amazing assortment of incredible game fish. While kayak fishing in warmer waters Sean has caught tuna, roosterfish, yellowtail, jack crevalle, dorado, pargo, mullet snapper, and sierra mackerel. While Sean enjoys hanging a big fish himself, nothing makes him happier than putting kids on their first trophy. Sean has successfully guided kids to quality dorado, jacks, pargo, mullet snapper, skipjack, stripers, and largemouth. Sean believes that these early positive experiences lay a strong foundation toward creating active youth with a love of the outdoors. Matt Moyer started fishing at a young age, his father Steve taught him to fish the freshwater as soon as he was old enough to hold a rod, moving up to the salt water species such as bay bass and halibut when he reached his early teens. It wasn't long before Matt was out fishing his father during their regular outings. Matt and his father had dreams of owning a boat together but could not afford one, so they did what ever they could to get offshore, including paddling their long boards outside the kelp to get at the bigger fish. In February of 2001, Matt's father bought them a pair of kayaks and that is when the adventure began. Since that time Matt has become one of the elite bay bass fisherman winning many of the local kayak fishing tournaments. If he did not win, you could usually find him placing in the top five, out of over a hundred entrants. No stranger to offshore kayak fishing Matt has caught Yellowtail and several White Sea Bass in the 30lb class with his largest going 44lbs. One of Matt's most exciting days on the water was when an 80lb. Mako Shark, which he landed then released, towed him for forty-five minutes. Matt is also an experienced Baja fisherman catching Roosterfish, Jack Crevalle, and assisting in the catch and release of two large Striped Marlin. Matt will be working with La Jolla Kayak Fishing as an affiliate guide, assisting Jim Sammons with larger groups during bay and offshore trips. Jim has taken Matt under his wing and together plan on introducing more people to the rapidly growing sport of ocean kayak fishing. Matt along with Jim will be working closely with Ocean Kayak, in advisory rolls, to ensure the best fishing kayaks available. Matt's enthusiasm and passion for the sport combined with his fishing prowess makes him a great addition to the La Jolla Kayak Fishing family. 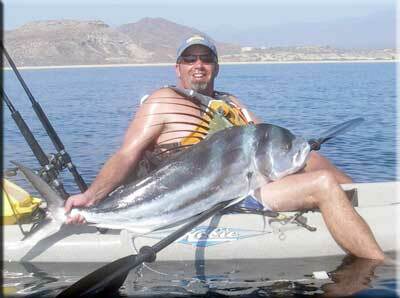 Matt can be reached via the La Jolla Kayak Fishing Bay Bass forum, which he moderates.